(CNN) - Texas Gov. Rick Perry will be joined by his family in South Carolina this weekend for a major speech in which he will strongly signal his intention to run for president, two GOP sources told CNN. During his visit to the key early primary state, Perry will also meet privately with dozens of South Carolina Republican leaders. Perry will then travel to New Hampshire where he will meet with party activists there. The Texas governor has been meeting with donors and talking to activists in key caucus and primary states for weeks as he lays groundwork for a potential campaign. 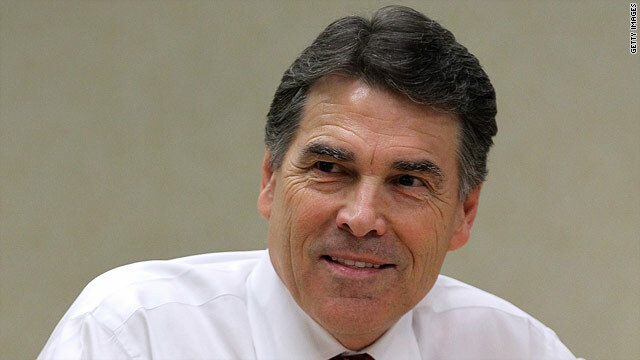 A formal declaration of candidacy is expected sometime before Labor Day, but Perry's advisers have not revealed a specific announcement date. Michelle B. and her husband are going to pray Perry out of the picture. Why don't they just PRAY FOR RAIN !!!!!!!! Just what the GOP, Greed Over People, party needs – another far right-wing, fundalmentalist holy-roller, bigoted, rich white guy without a clue about global economics or public service beyond his own pocket book entering the race for the republican nomination. Vote America - vote to say "No Way" to the party of "No." Let's be rid of these petulent GOP crybabies and their demented teabagger breatheren. Probably when Perry announces his run, he will claim that God told him to do it. That will be red meat for Red America. Yay we are all saved! Uhhhh......what? What does "signal my intention" even mean? Is this moron Perry a Palin? Gee, Texas, please figure out a way to resurrect Ann Richards. I'd pay to see the smackdown she'd give flim flam Perry and the Tea Partiers. For the love of whatever you worship or don't, America please be warned. This man has WRECKED our state and will completely eff this country up more than what it is now. He is a crusading opportunist that has left Texas in almost ruin. Don't do it America...just don't do it. Early this year Perry had prayer day for rain – and texas is in its worst recorded drought. Now he had prayer day last Saturday for the economy – and the stock market tanked today. Obviously Perry's line to Jesus is broken or he is the anti-christ we've all been warned about. Beware of this man. Know matter whose in office , the many negative comments already proves The Nation is on the decline. I live in Texas and he has done a TERRIBLE job being Governor. Rick Perry closet is full of DIRTY laundry even he knows it. Once his records in Texas have been reviewed hell he can’t even balance this state budget let alone the country. Sit down Ricky boy you really don’t want people looking at all your records. Then it will be verified how big a FOOL you really are. Perryez and Texico just need to secede !! Great. Another Texas Gov. This is like an intelligence test for America. Are we really that stupid?